Very interesting to see how prof. Christensen in 2017 builds on professor Theodore Levitt’s quote said in 1962 “People don’t want to buy a quarter-inch drill. They want a quarter-inch hole” to exemplify that customers don’t want products but solutions for their problems. What seems to be a truism for new comers (essentially they identify and understand what the job-to-be-done is, which is in general poorly solved by incumbents as a single way to have a chance for the formers to compete), seems to fade away once those same entry companies achieved success (“the job-to-be-done that brought them success in the first place can somehow get lost in the shuffle of running and growing the business; they define themselves in terms of products, not jobs”). 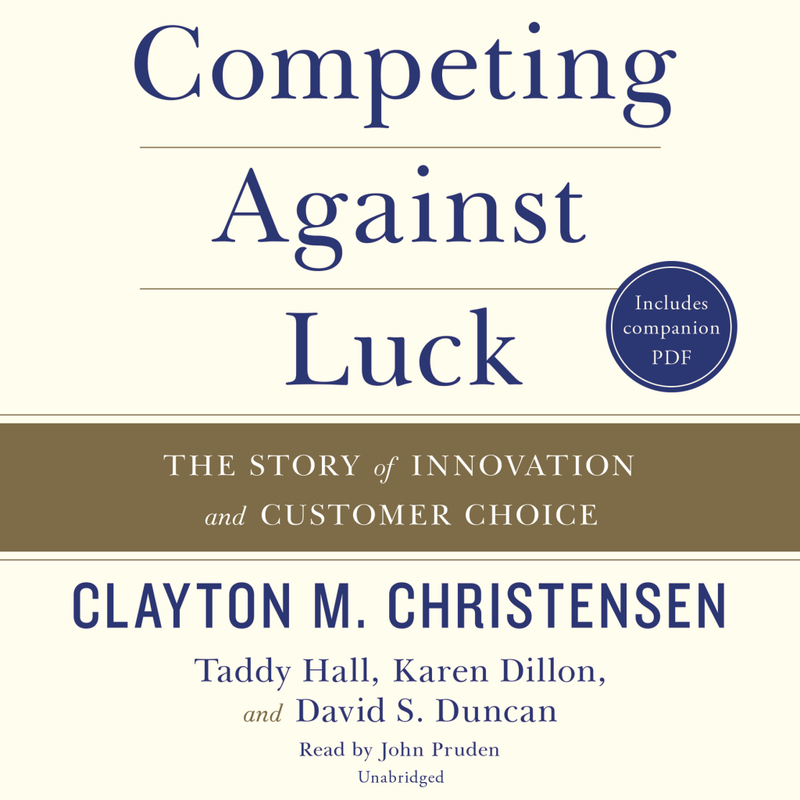 In his new book Prof. Christensen arguments that by understanding what causes customers to “hire” a product or service, any manager can improve their innovation track record. Jobs theory (so he calls it) offers new hope for growth to companies frustrated by their hit-or-miss innovation efforts. The idea is a simple one: when you truly understand what causes consumers to make the choices they do, innovation can be far more predictable. The key is to understand the causality behind why the customer might purchase a particular solution at a particular moment. When a customer buys a product, he essentially “hires” something to get a job done (to overcome a struggle). If it does the job well, when he is confronted with the same job, he will hire that same product again and again. However if it does a poor (of quality) job, he fires it and looks around for something else he might hire to solve the problem. Understanding what causes the problem is essential to create the right solution. Once you have uncovered and understood the job, you need to translate those insights into a blueprint to guide the development of your products and services and finally, ensure that you align your internal capabilities and processes to nail that job consistently. Prof. Christensen’s recommendation is that “if you are to create products that customers want to pull into their lives, you have to drill deep and look wide, identifying not only the functional but also the social and emotional dimensions of the progress your customers are trying to make”. In this sense, the Jobs theory does not differ much from the Design Thinking approach. However he defends that as you look at innovation through the lenses of DT, what you see is the customer at the center of the innovation universe; when you look at it through the lenses of the Jobs Theory what you see is the struggle (to be solved), the nagging tradeoffs, the imperfect experiences and frustrations in peoples’ lives, something that according to him makes a difference between both approaches. As it may be, what is important to getting hired is to understand the narrative of the customer’s life in such rich detail that you are able to design a solution that far exceeds anything the customer themselves could have found words to request. What it is really important is to know your customers better than they know themselves. Gaining empathy is then the key, something that is paramount in DT too. Truly understanding your customers through the job to be done provides a sort of decoder of the complexity surrounding them which serves as a job spec. The job spec (a sort of innovation intent in the DT argot) is from the innovators point of view what you need to design, develop and deliver through a new solution so that it solves the customer’s job well. It becomes the blueprint, an actionable guide for innovation. It includes the functional, the emotional and the social dimensions that define the desired progress, the tradeoffs the customer makes, the full set of competing solutions that must be beaten and the obstacles and anxieties that must be overcome. The challenge is that that understanding has to be matched by an offering that includes a plant to surmount the obstacles and create the right set of experiences in purchasing and using the product. The last step of the process is to integrate theses experiences the new solution must bring into the company’s processes. Something that is not easy because organizations typically structure and measure themselves around function or business unit and not around the job to be done. Prof. Christensen takes advantage of jobs theory and presents it as a powerful tool for focusing and leading organizations. Focusing and organizing around the job to be done allows companies to operate like a network of start-ups all of them aligned with jobs, which provide a kind of commander’s intent (a military term that explains why soldiers up and down the ranks know how to make the right choices absent a specific order). So the job to be done serves as a compass. Although it sounds doable on paper, reality is tough and stubborn and unless organizations also shift their performance criteria to measure their success from internal financial metrics to externally relevant customer-benefit metrics, things won’t really change no matter how well argued the theory is.